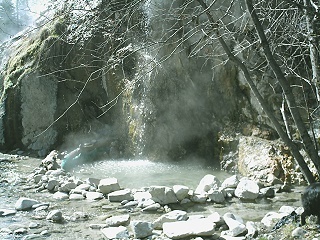 At the end of a leisurely 0.25 mile stroll through the bountiful Boise National Forest on a well used trail alongside Warm Springs Creek awaits the geothermal wonder known as Bonneville Hot Springs. 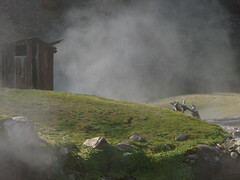 The hot springs feature user built rock walled pools with sand/silt bottoms and a private soak shack that houses a cast iron bathtub complete with hot water piping and wooden stopper. Trailhead access can be found at the NW end of the campground of the same name. 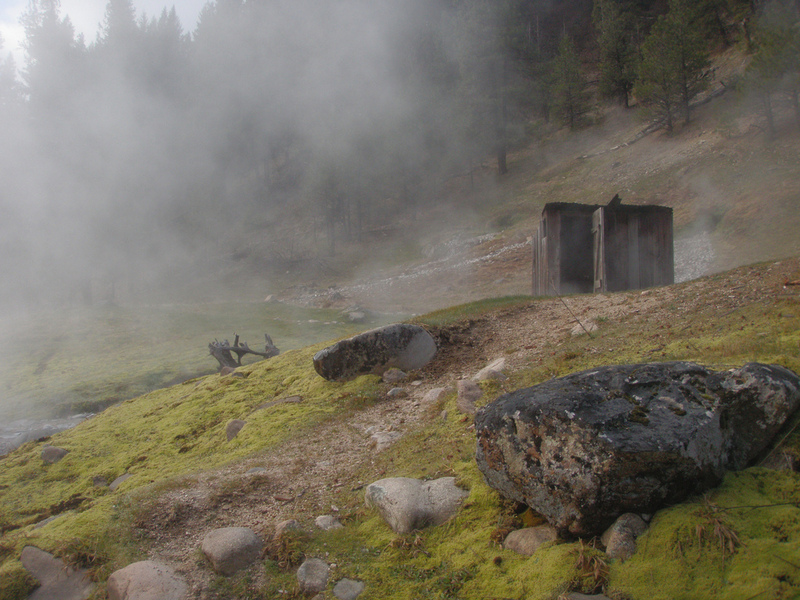 The best time IMHO to visit Bonneville Hot Springs is when the Boise National Forest campground of the same name is closed. A short hike along the river leads to a great reward. 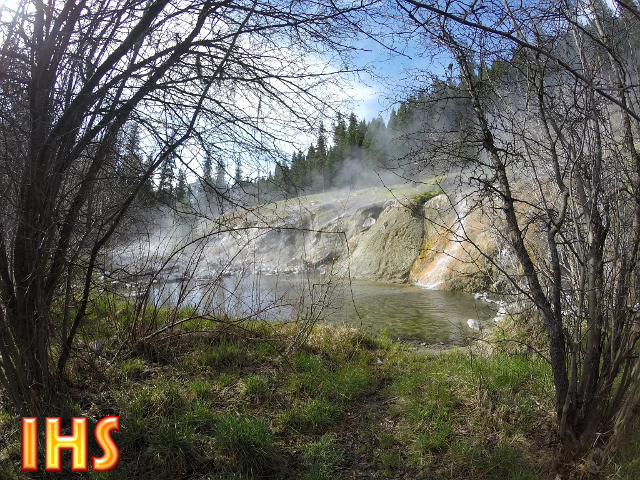 Bonneville Hot Springs Campground opens mid to late April, on occasion May (depending on snow levels) and closes in October or November. 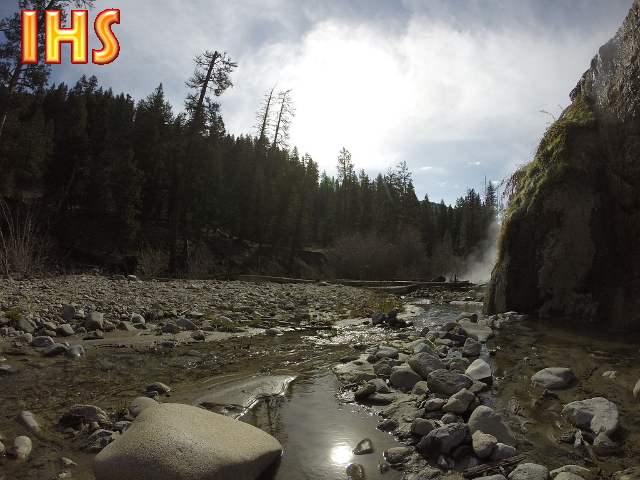 When the campground is closed and snow brim prevents parking at the gate, use the parking area for the Warm Springs Trailhead located just before the turnoff to Bonneville. There is a trail from the parking area that intersects with Bonneville campground, or you can just walk down the road to the official entrance. 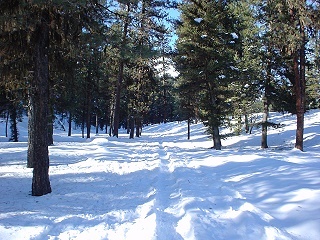 Snowshoes or skies are recommended when snow is on the ground. Nothing but awesome. 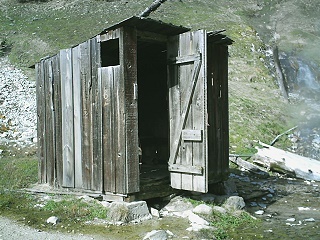 No trash, incredibly soakable primitive pools and soak shack, no trash (!! 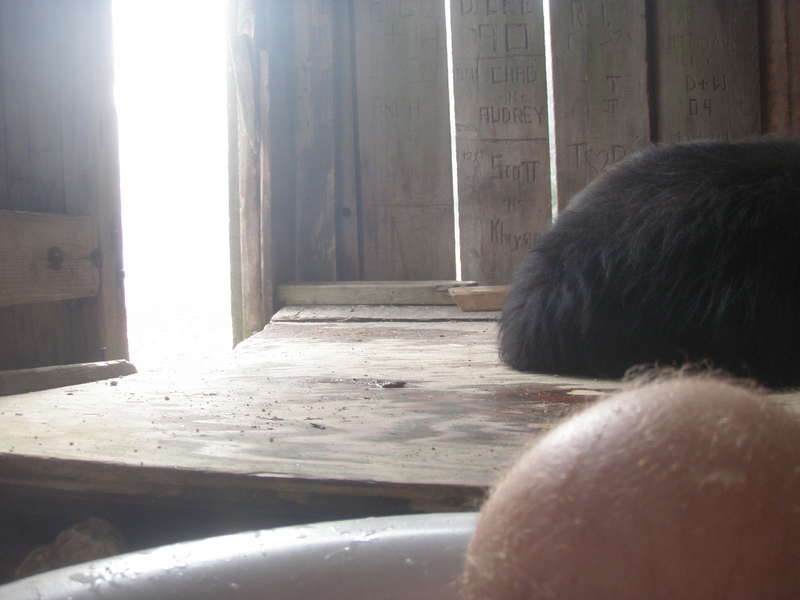 ), watched a group of deer graze while soaking... enough said. 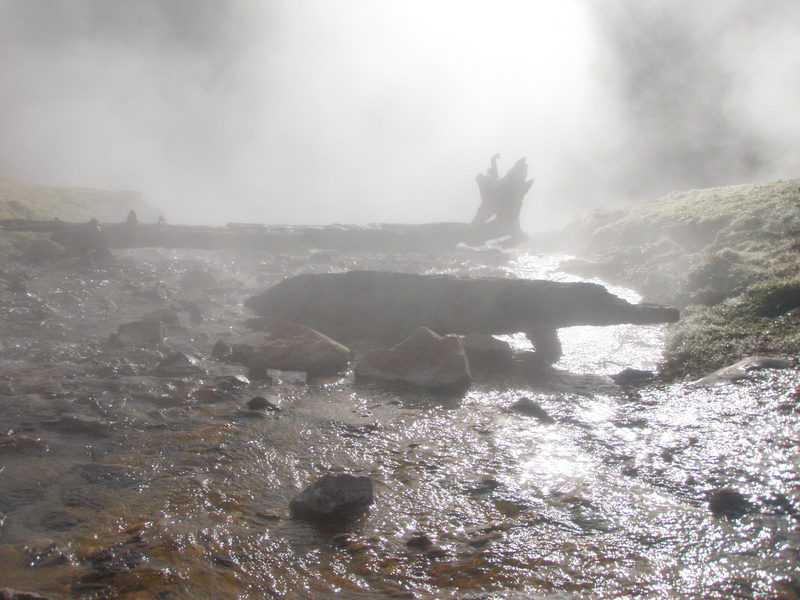 I'll never forget what it felt like to drop down that last wedge of trail just as the monolithic, steaming geothermal mass known as Bonneville Hot Springs revealed itself for the first time. Sunrise at Bonneville is a special treat, especially this time of the year. 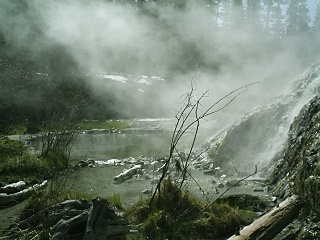 The cold, brisk spring air is usually in the 30s this early, which means the large expanse of hot water will churn out steam reminiscent of geyser giants in Yellowstone. 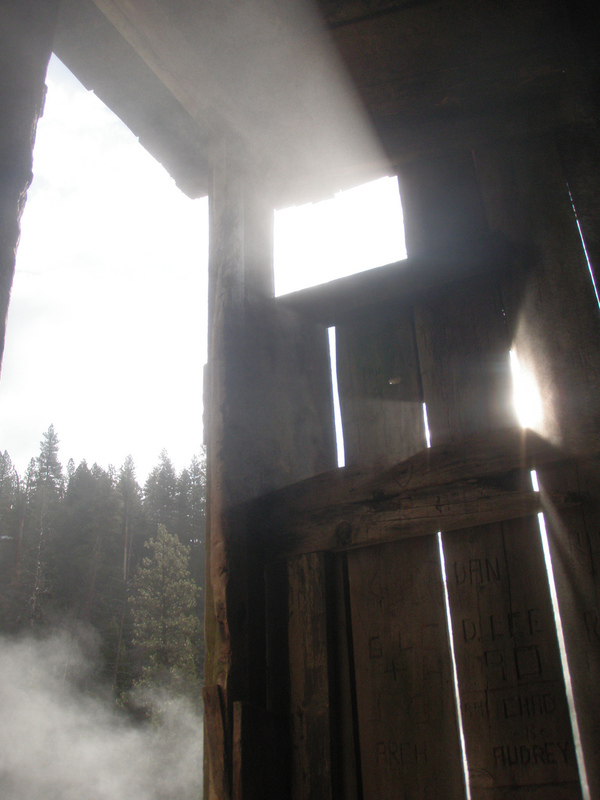 Add to that the unique light radiating from the rising sun and you have a very mystical-ish environment. It's like venturing into another world, that is, before the air warms and sun fully crests the treeline horizon. Visiting Bonnie this time of the year has inadvertently become a tradition. I didn't realize it until today, but I've been returning this place during early spring for years. 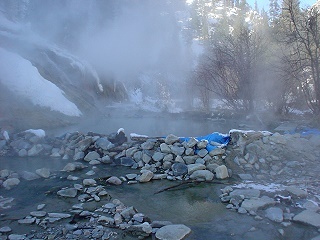 Despite heavy traffic at nearby Skinnydipper, Hot Springs CG, Pine Flats and extreme usage at Kirkham Hot Springs, Bonneville was left alone. For a bit. 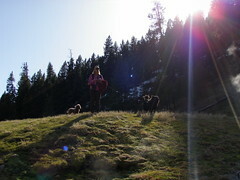 There was patchy snow and ice on the trail, clearly the time for snowshoes and skies has come and gone. The entrance and gate to the campground of the same name remain closed until May 20, when the campground officially opens. For me, the extra mileage just ensures the journey is that much more worth it. That's actually a good rule-of-thumb to live by. 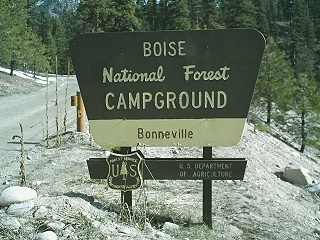 The trailhead to Bonneville is located at the north end of the campground. I was really excited about not finding ANY trash! Not having to enact my typical pre-soak, trash bagging routine is always a huge plus. Watch the video for the deets. On the trail, I encountered 3 young ladies from Boise State who were on a hot springs sojourn for their last day of spring break. I remember those days fondly, as most of my spring breaks as a student were spent trudging through the snow and sun ISO stellar soaks. 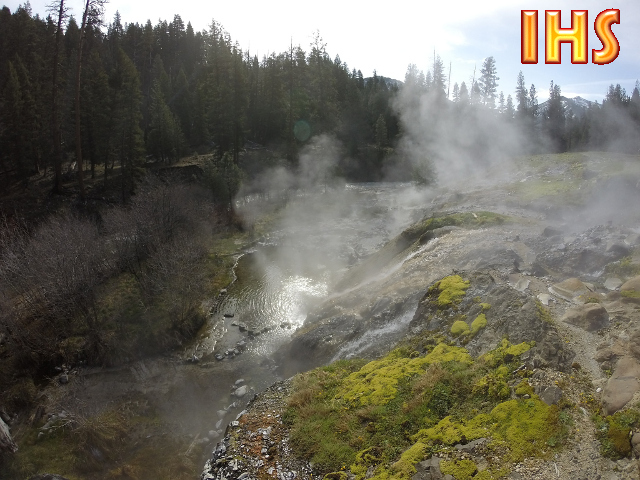 That's how real Idahoians do spring break, ha ha. They were really nice, I was a bit worried about the two that had flip flops on. I noticed they were equipped with the BNF flyer the visitor centers and ranger stations have been handing out for years. 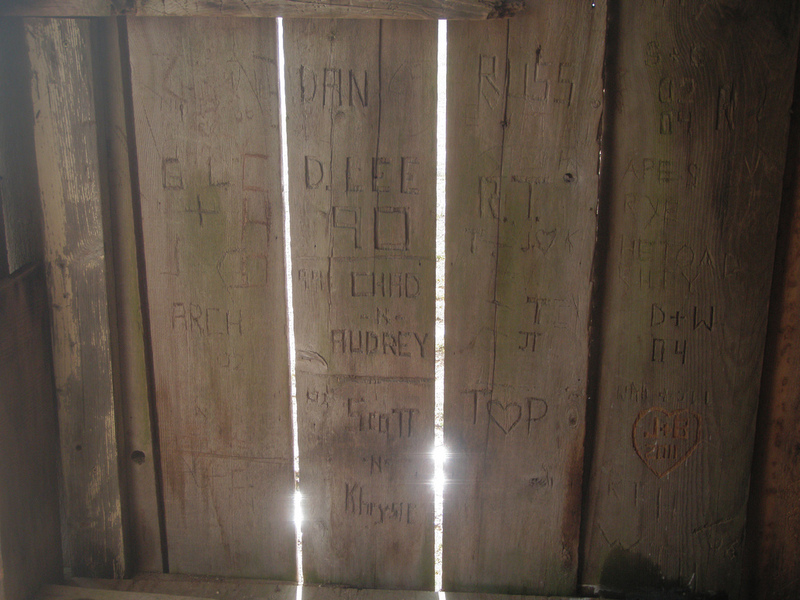 I also noticed that they were from Kootenai County. Which, ironically, is where I too came from prior to making Boise my home to attend Boise State (and how I came to discover hot springs, but that is another story). Up north we've got a lot of big, HUGE lakes. Any one of which make Lucky Peak resemble a puddle. 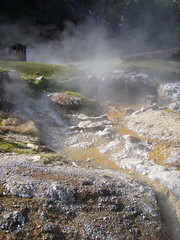 However, the north severely lacks geothermal wonderment, except for those few hot springs located in the Clearwater National Forest and Selway-Bitterroot Wilderness. 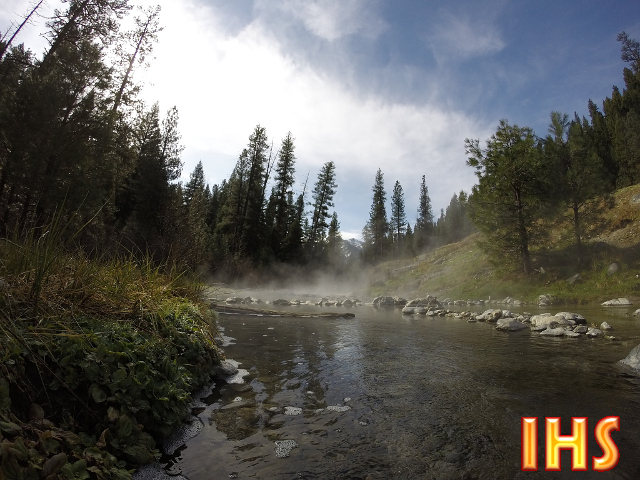 Idaho really does have it all, backcountry-wise. By the time my vehicle was in sight on the return hike two more cars had pulled into the small pullout in front of the campground gate. Even though the day started in the 30s, it was nearing 70 out after I tossed the pack in the back of the truck. I have been pleasantly surprised how nice and considerate soak seekers have been of late. I hope this trend continues, as the growth-rate for the human Jackhole sub-species seems to always be on the rise. 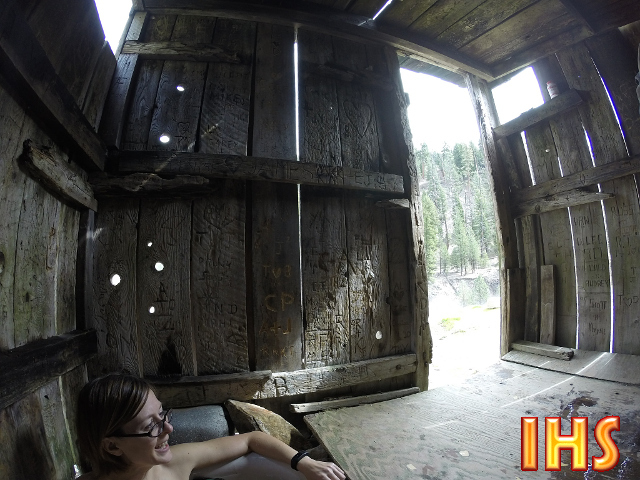 I immensely enjoyed the hike in, soak and hike out at Bonneville. 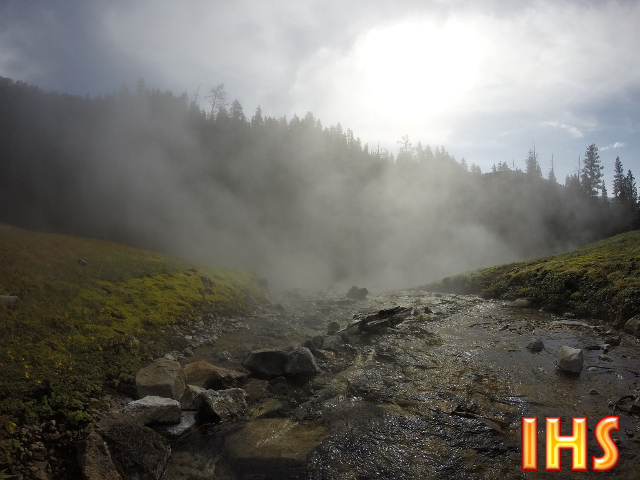 Maybe one crisp, early spring morning, it is you that I'll quietly hike past whilst wandering down your own path to geothermal enlightenment. 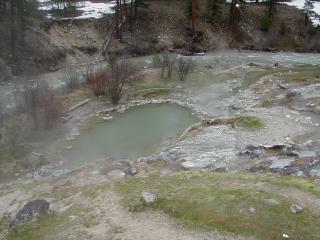 At the start of every Spring I like to hike out to Bonneville Hot Springs in the Boise National Forest. 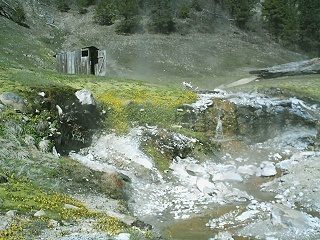 The campground of the same name is still snowbound, and remains closed while the hot springs are somewhat accessible. 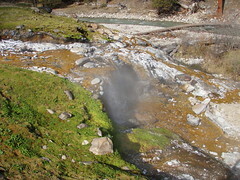 It's just in time to beat Spring runoff, when snow melt from the mountains will surge through the creeks and rivers, submerging and obliterating any man-made soaking pools. This is one of the only times you can experience such an incredible place for oneself. I come because it's the perfect time of the year to renew my relationship with nature. On the hike out, after a glorious soak mind you, I passed a crazy guy with a tiny backpack on and aqua socks who was followed by a lady in sweats. It's actually still winter out here. I hope you guys made it in/out ok!! The super-soaker is back in action after being repaired by multiple volunteer groups. This was exactly what I needed. 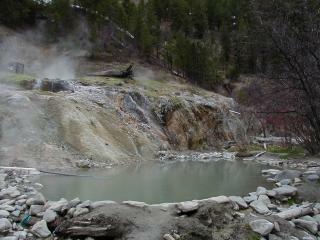 The campground entrance was gated, which elongated the hike to the hot springs, which I welcomed. It was a beautiful day. The snow was hard enough to walk on, making an icy sidewalk that reached all the way to the geothermal complex. I am sad to report that the king soaking pool is somewhat dismembered. There's hope, but serious work will be needed to patch up the rock walls. 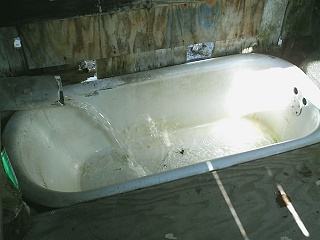 The soak shack was in good repair, as was the round-the-bend pool. I had to break the chain; the last 2 times I've been here were both in April. No more. 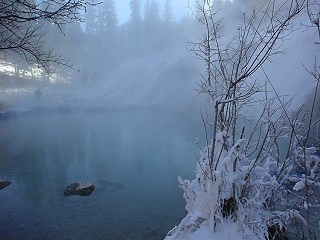 January proved to be the perfect time visit Bonneville Hot Springs. We could have snow shoed or cross country skied into the hot springs, but boots were our selected mode of transportation. Luckily there's almost always a well-packed trail . In the past, the entrance to the campground was plowed just enough for a couple vehicles to park. 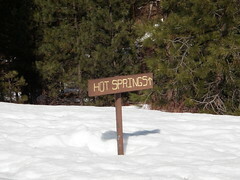 This time the only place to park was at the Warm Springs Trailhead parking area shortly before the Bonneville campground entrance, which is also an alternative route to the hot springs. The hike out was brisk, air temperatures were in the low 20s, but the blue sky and snow covered forests more than made up for it. We passed a couple on skis and snowshoes on the way in, and arrived in time to greet a sole soaker and his dog on their way out. The big news of this visit was most definately the rebuilding of the large pool. The south side of the pool had been dug out more, and a new rock holding wall replaced the old, leaky rock pile wall. The result? Excellent. I've never seen the pool look and feel better. 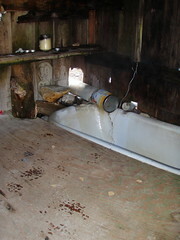 Temps were around 104 in the large pool and 105 in the soak shack. 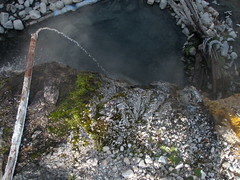 The other pools around the bend clocked in around 103. Sweet. What a trip! I feel a little sad that is has been 4 years since I've been back here to qualify for a soak. The campground is still closed and gated, but there was a sign posted on the gate stating that it would open on April 15th... hmmm today is the 20th. 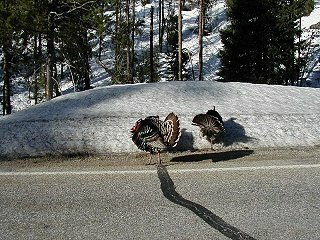 My best guess is that it will take the snow another couple weeks to melt, plus time for the forest service crews to come in and prep the grounds - so the campground should be open in May sometime. It was a very scenic hike through the snow while basking in the warm glow of the sun. Spring is just beginning here. We passed a friendly guy on the hike to the hot springs. He opted to not soak, citing large amounts of silt as the reason. Our soaking party discovered quite the opposite. The soak shack, mega-pool and waterfall pool were all in great soaking condition. There was silt in the mega-pool, but there was also a good sized silt-free zone - optimal for soaking. This is the best time of the year to visit Bonneville. Warmer months bring in a steady stream of campers, and by the end of the summer expect ORVs and other vehicle traffic to kick up enough dust to coat the inside of your tent or camping device. During the core of winter Bonneville sees a steady stream of Nordic and snowshoe recreational enthusiasts. 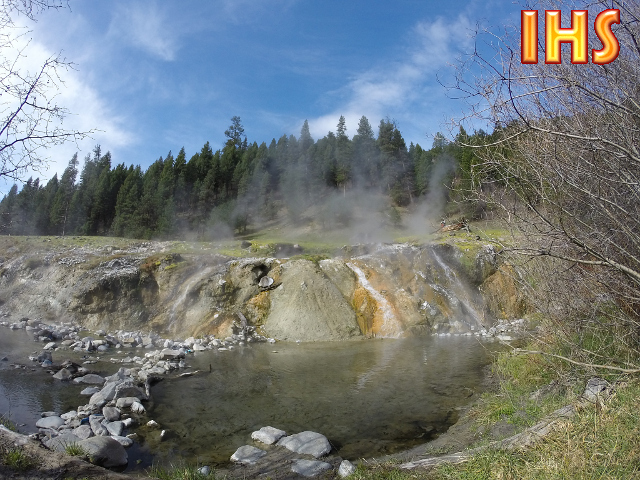 It is only during this time of the year, while the snow is melting and the ground features a smattering of bare spots, can you soak in solitude and truly enjoy this hot springs haven. 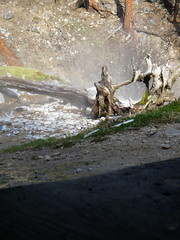 The main pool was a little cool even despite some minor attempts to block some of the cold creek water. The attempts were minor because we made the mistake of getting in before testing the temperature and were subsequently freezing while climbing around and shifting rocks. It wasn't too bad right next to the pipe. 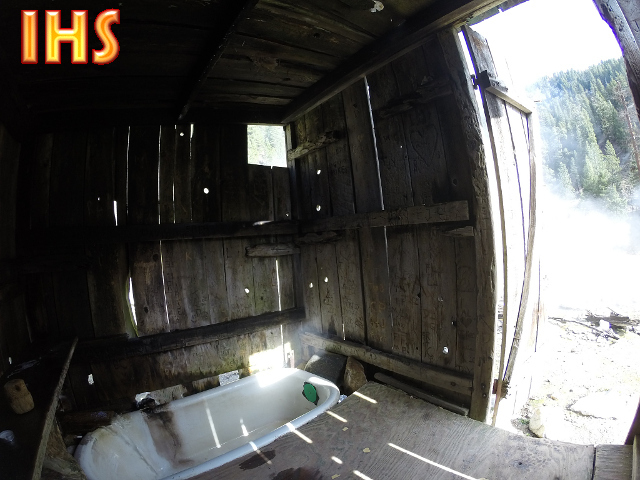 The rustic shack with the single tub was good to go, but had the distinct look of being un-used for quite some time. The campground of the same name off Highway 21 was closed, which just made for a nice hike through the snow. 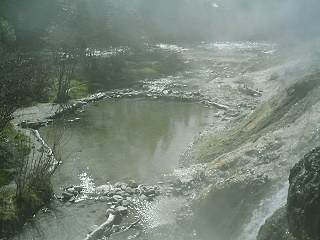 According to Evie Litton's Book "Hiking Hot Springs in the Pacific Northwest" there is another pool located just below the source large enough for 2 that we missed. We did notice submerged pools in the creek that might have potential during the right time of year. 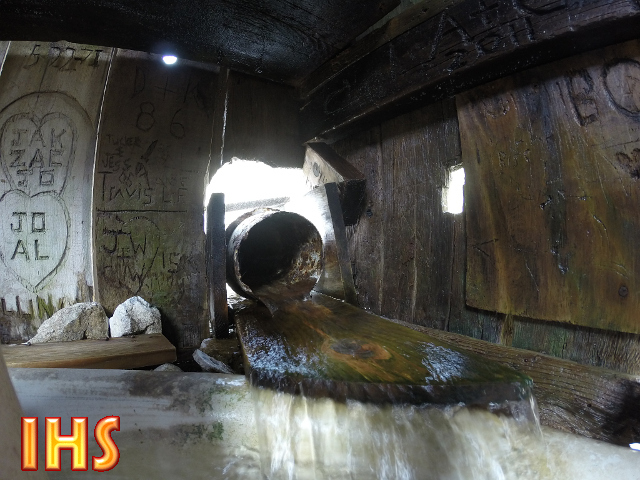 We soaked all by ourselves for about 15 minutes before being joined by a friendly FS Stream Surveyor lady. Kudos to her for carting the dirty diaper out along with other trash. We filled all of our extra plastic bags with garbage and believe it or not even got dirty looks from a couple groups of people approaching the pool while doing so. Shame shame! They had GUILTY written all over their faces. Despite hwy 21 being closed from Grandjean to Stanley (Banner Summit Area) this place was jam packed! There were approx. 10 cars in the parking area and another couple parked just off the site of the road. This place was snowshoe city! The campground was closed/gated, there was one grocery grabber leaving and another either unloading or loading up composed of a couple cute snowboarder girls around 11:30am. A moderate amount of people were camping and soaking. 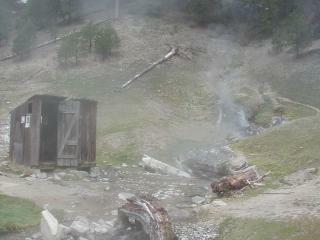 The campground and hot springs were closed because the National Forest crews were busy reconditioning the roads. Wow! Even in mid-May this place was packed! Textile city! A quick look at all of the people was enough to spur us on to another soaking destination. Full campground = full soaking pools.